Shoot with the accuracy of Navy SEAL hero Chris Kyle this season with a brand new gun rest, bipod, or tripod to help you steady your aim. By choosing the right materials, settings, and weight, you can use this accessory anywhere you bring your gun. GrabAGun offers rests that are sturdy enough for heavy use at the range, while still being lightweight, collapsible, and portable for taking your firearm deeper into the woods, and adjustable for height and windage so you can use it in varying climates and settings. Experts have explained there isn’t one gun rest that works for everybody, and that’s why GrabAGun provides multiple options. Amplify your tactical game by using the perfect gun rest, bipod, or tripod that can help you achieve an optimal vantage point for zeroing in on your target and achieving high accuracy every time. A tripod is a great way to hold a gun still for a slow and steady shot. A bipod allows for a little more movement while helping eliminate the unsteadiness and unpredictability of a wavering heavy gun before pulling the trigger. If a more standard bipod or tripod doesn’t quite suit your needs, how about a bag rest that gives a little as you adjust? Known for being highly versatile, bag rests allow for easy movement as you prepare to take the shot. If that isn’t the right gun accessory, try an easy set-up shooting stick—which is way more useful than a selfie stick—that will help you stabilize your shot and make it easy for you to pack up and move toward the next target. Some firearm accessories can be something you didn’t know you needed, and our gun rests, bipods, and tripods fall into that category. Whether you’re on rough terrain or you’re already level, your marksmanship can be spot on with the right device to hold it up. 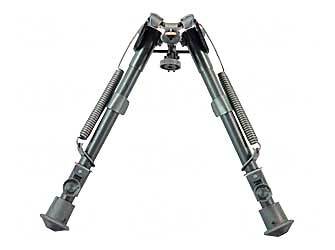 Keep your shot strong and steady with a gun rest, bipod, or tripod from GrabAGun.